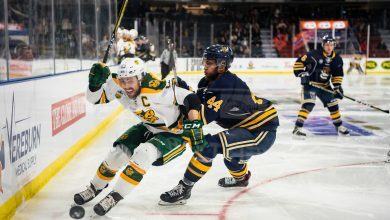 The Golden Bears hockey team raised their CIS championship banner on Friday night, but the Mount Royal Cougars weren’t in the mood to celebrate, as they beat the Bears 4-2. 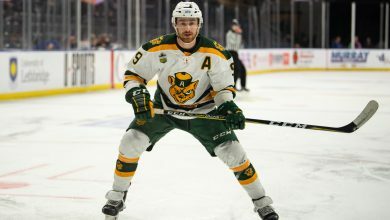 It was a lackluster effort from the Bears all around, as they only managed six shots on net in the first period, but were still able to enter the second leading 1-0, as captain Kruise Reddick took advantage of a wide open opportunity in the slot, wiring a shot past Cougars goalie Colin Cooper. The lead wouldn’t last for the Bears, as the Cougars took control of the game in the second period, outshooting the home team 10-4. The visitors were able to tie the game after taking advantage of a bad giveaway by Bears goalie Luke Siemens, as he put his clearing attempt right on the tape of sophomore forward Jamie King, who promptly deposited the puck into the yawning cage. 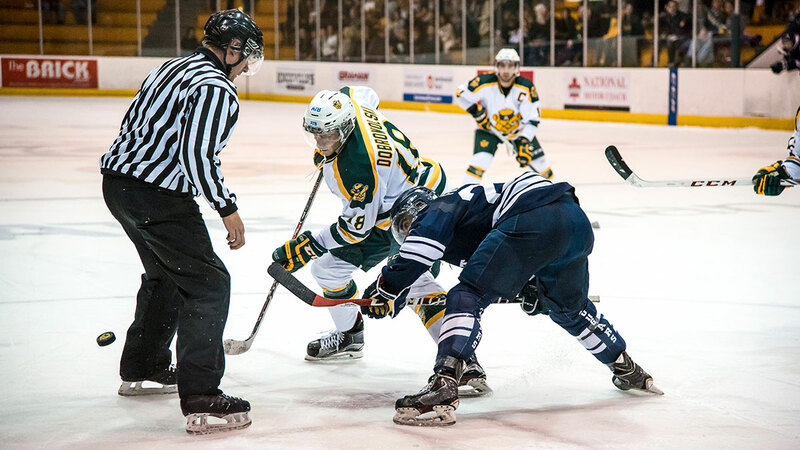 The Cougars were able to pull ahead under two minutes later, as Canada West scoring leader Tyler Fiddler broke the deadlock with a nice solo effort — weaving around two Bears defenders before firing a shot over Siemens’ shoulder. The third period wasn’t any kinder to the Bears, as they continued to be stymied by the Cougars’ defence, and at the 14 minute mark, Tanner Olstad finished on a breakaway to push the Cougars’ lead to 3-1. The Bears were able to mount a surge after that goal, and managed to pull within one, as Rhett Rachinski banged in a rebound, but it was too little too late, and ultimately, King would add his second goal of the game on an empty net, to make the final 4-2. Head coach Serge Lajoie was not pleased with his team’s effort on Friday. “We were a team that just wasn’t ready to play,” Lajoie said. The Cougars outshot the Bears 19-10 through two periods, and only a late flurry by the home team made the shot chart at the end of the game close, as the Cougars still held the shot advantage, 28-26. 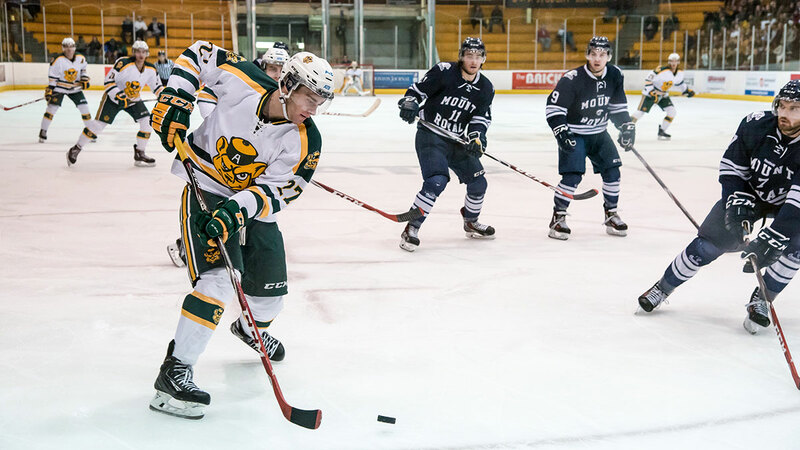 In the second half of the home-and-home, the Bears bounced back with a much more spirited effort, outshooting the Cougars 34-21, but were held scoreless until the second period by an excellent performance by Cooper in net. At 9:15 of the second period, the Bears were finally able to break through, as Rhett Rachinski was able to pick the puck out of a crowd in front, and fire it past an outstretched Cooper. The pesky Cougars were able to equalize before the end of the period however, as Matt Bellerive was able to beat Luke Siemens with a seeing eye shot. There was no scoring in the third period, but the Bears held the shot advantage once again, with nine to the Cougars’ four. With less than a minute left in the third however, Tyler Fiddler took a high sticking penalty, which carried over into the overtime period. The Bears were able to capitalize on their advantage, as Jordan Hickmott fired a shot over Cooper’s shoulder, salvaging a weekend split for the Bears. The Bears will now take to the road to face the Saskatchewan Huskies, who sit atop Canada West currently, with a perfect 6-0 record. The Huskies rolled over the Regina Cougars last weekend, outscoring them 9-3 in their two games.